This past Monday, over 75 wine buyers, writers and sommeliers gathered to participate in a remake of the 1976 Judgment of Paris, dubbed the Berlin Tasting. The Judgment of Paris was a wine competition organized by a British wine merchant named Steven Spurrier, designed to pit top-quality French and American Chardonnays and Cabernet Sauvignons against one another. At the time, Spurrier only sold French wine. 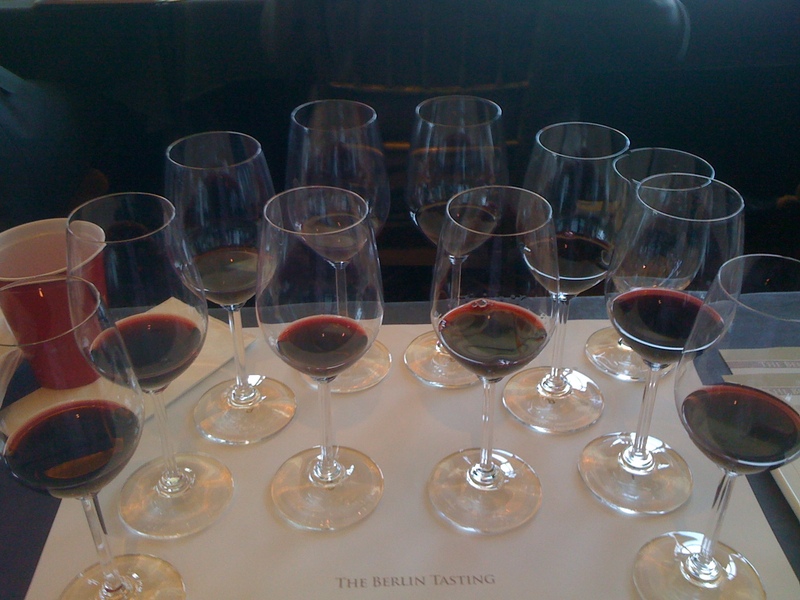 The Paris tasting prompted these follow-up tastings: The San Francisco Tasting of 1978, The French Culinary Institute Tasting of 1986, The Wine Spectator Tasting of 1986 and The 30th Anniversary Paris Judgment Tasting, which took place simultaneously in both Napa and London. Each time, American wines came out on top. Back in 1976, this upset made the cover of Time magazine (the reporter, George M. Taber, was there Monday, too), while being ignored by the French press. The 2008 movie, Bottle Shock, was inspired by this tasting as well. 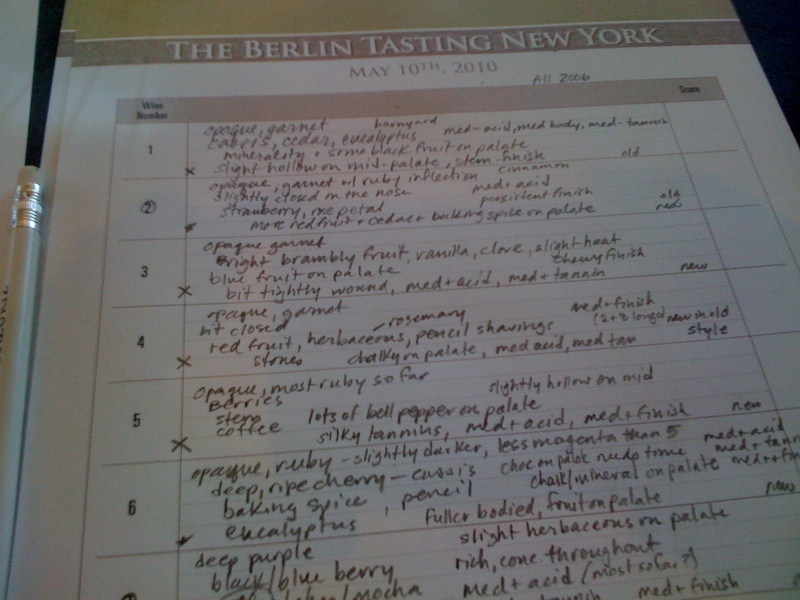 Regardless of your opinion on subjectivity of taste and statistical interpretation, these events were a boon for new world wines. Eduardo Chadwick, the President of Viña Errazuriz, wanted to see if this could work for Chilean wines and with the help of Spurrier, organized a tasting in Berlin in 2004, pitting his wine against top French and Italian wine. These tastings were repeated year after year, from Brazil to Tokyo to Toronto to Copenhagen, finally arriving in New York this week. The views from the ballroom at the Mandarin Oriental aren't shabby. 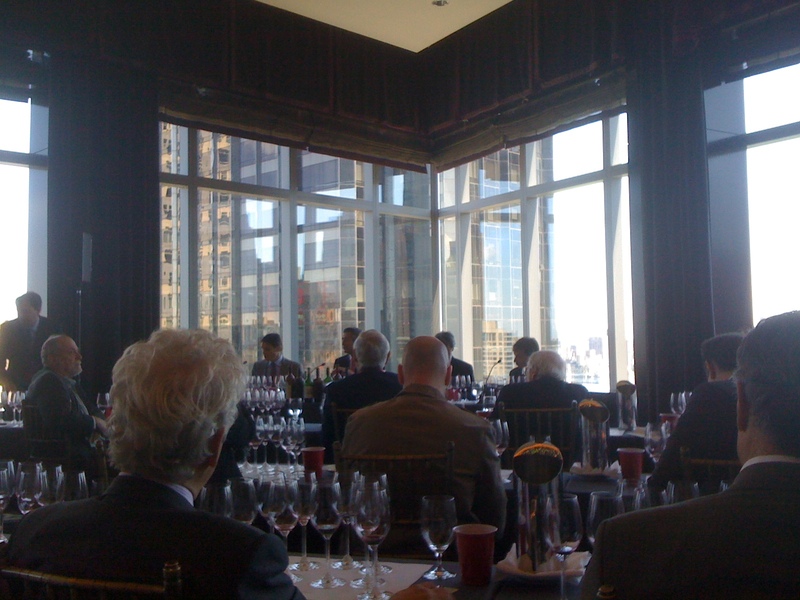 The panel sitting at the front includes Eduardo Chadwick, Steven Spurrier, Francisco Baettig (chief winemaker for Errazuriz) and the founder of Vintus, their American importer. We were given 10 wines to taste blind, and asked to pick our top 3. My notes. We knew there were French, American, Italian and Chilean wines and that they were all from the 2006 vintage. On a separate sheet of paper, we simply noted our top 3 selections. Our first pick was worth 3 points, our second worth 2 points and our third worth 1 point. The results were tallied while we were all still there. My top pick was also the Kai. My #2 was the Stag’s Leap and my #3 was the Seña. Spurrier’s top pick was the Chadwick and his #2 was the Kai. Were some of these wines not ready to drink yet? Sure. You might also think to yourself, with 5 out of the 10 wines from Chile (from the same producer), how badly could they fare? All that being said, had you asked anyone on the way in, I highly doubt he or she would have anticipated that a Carmenère-based wine from Chile would beat out heavy-hitters from around the world.